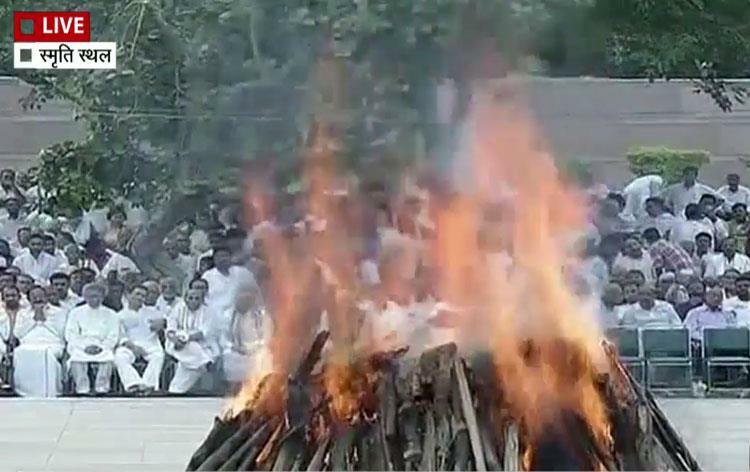 The mortal remains of Former Prime Minister Atal Bihari Vajpayee were consigned to flames with full state honour at Smriti Sthal in New Delhi this evening. The funeral pyre was lit by his daughter Namita Kaul Bhattacharya amidst chanting of mantras. President Ram Nath Kovind, Vice President M Venkaiah Naidu, Prime Minister Narendra Modi today paid their last respects to Atal Bihari Vajpayee at Smriti Sthal. King of Bhutan Jigme Khesar Namgyel Wangchuck, former President of Afghanistan Hamid Karzai and Acting Foreign Minister of Sri Lanka Lakshman Kiriella also paid their last respects. Army Chief General Bipin Rawat, Navy Chief Admiral Sunil Lanba and Air Chief Marshal B S Dhanoa paid their last tributes to Atal Bihari Vajpayee. Lok Sabha Speaker Sumitra Mahajan, former Prime Minister Manmohan Singh, BJP President Amit Shah, Senior BJP Leader L K Advani, Defence Minister Nirmala Sitharaman also paid their respects. Earlier, Prime Minister Narendra Modi led the funeral procession from BJP headquarters to Smriti Sthal. Mr Modi along with BJP President Amit Shah, host of cabinet Ministers, many Chief Ministers and other leaders walked alongside the casket. Thousands of people joined the procession along the route till Smriti Sthal, where the mortal remains will be consigned to flames. A huge crowd of people showered petals at the procession and jostled to get a glimpse of the departed leader. People chanted the slogan "Jab Tak Suraj Chand Rahega, Atal Ji Ka Naam Rahega" and "Atal Ji Amar Rahe". Chief Ministers of Uttar Pradesh, Haryana, Chattisgarh, Madhya Pradesh, Delhi, Lok Sabha Speaker Sumitra Mahajan, Congress President Rahul Gandhi and others prominent leaders are present at Smriti Sthal for the funeral. 93 year old Vajpayee, passed away at AIIMS in New Delhi last evening after a prolonged illness.